When the Romans built a road from Noviomagus Reginorum (Chichester) to Clausentum (Southampton), it crossed the River Hamble at a natural crossing point located to the south of present-day Botley. The crossing later became the site of Botley’s first settlement, which existed at least as far back as the tenth century. Known in Saxon times as ‘Bottaleah’, some time prior to the Norman conquest a gradual rise in sea level meant that travellers found the river easier to ford further north of the original Roman crossing. This new crossing place provided a new focal point for the village, which in 1086 was listed in Domesday Book as 'Botelie' and included two mills and had a population of less than 100. In 1267 John of Botley, Lord of the Manor, obtained a royal charter from Henry III, for holding an annual fair and weekly market in the town. The village did not, however, grow significantly and in 1665 the village still had a population of only 350. During the eighteenth century, Botley functioned as a small inland port with barges transporting coal, grain, timber and flour along the river. The first bridge over the tidal part of the river was built in 1797 and by the time of the 1801 census 614 people resided in the village. A corn market was opened in 1829 and a cattle market in 1836. In 1839 the London & Southampton Railway Company presented a Bill to Parliament to construct a new line from a junction with their London to Southampton line at Bishopstoke (later Eastleigh) to Gosport via Botley and Fareham. Despite some local opposition, the Bill was passed and construction was quickly underway. The London & Southampton Railway changed its name to the London & South Western Railway in June 1839. 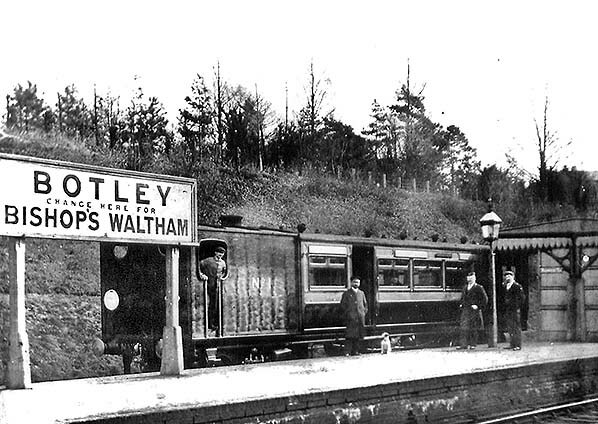 At Botley, contractor Thomas Brassey had difficulty finding firm ground and before the station could be built wooden piles had to be driven into the ground to provide a solid foundation for the station building. Botley station was sited ¾-mile east of the town and was actually in the parish of Curdridge. In 1904 Curdridge parish council asked the L&SWR to add Curdridge to the station name but its request was refused. The line opened on 29 November 1841 against the advice of the Board of Trade inspector who was concerned about the stability of Fareham Tunnel and the likelihood of land slips in the northern approach to the tunnel. The inspector's fears were quickly justified on 2 December when heavy rain made the clay in the cutting unstable rendering the line unsafe for passenger working. Once substantial repairs, which included opening out the approach cutting, had been completed, the line was once again inspected by the Board of Trade and reopened on 7 February 1842. As built, Botley had two facing platforms largely on the west side of Station Hill but extending for a short distance on the east side of the road. On 1 June 1863 Botley became a junction, following the opening of the Bishops Waltham branch which ran into a new bay platform on the down side. At that time, the Botley stationmaster James Whitney was also responsible for the station at Bishops Waltham. The main station building was on the up side and comprised a plain two-storey square brick building under a hipped slate roof. The upper floor of the building was the accommodation for the station master and this had a gabled entrance at the top of the approach road. The entrance to the station was through an arch on the west side of the upper level of the building from where steps led down to the platform. The entrance to the booking office was at the bottom of the stairs where there was a door in the side of the building. A separate gents' toilet was located at the east end of the building. On the down platform there was a small open-fronted timber shelter with a roof sloping on both sides to provide a small canopy over both the down platform and the bay. Company records do not say when this was built. If it was provided when the station first opened, it would have been substantially altered to provide access on both sides when the bay platform was added for Bishops Waltham trains. By the last decade of the nineteeth century a siding had been laid along the Bishops Waltham branch for a short distance on the down side running parallel with the branch line. The goods yard comprised a single siding with a loop on the up side. This served a large cattle dock with pens. A two-ton capacity crane stood at the east end of the dock. A two-storey goods warehouse was provided at the back of the dock with a smaller goods shed and office alongside. Goods traffic quickly grew with the local flour mills taking advantage of the goods facilities from an early date. Timber and farm produce, including livestock movements, were another common feature. It did not take long for the numerous local fruit growers, especially strawberry growers, to realise the potential of the railway to transport their highly perishable products rapidly to market centres up and down the country. Although local coal merchants rented wharfage at the station there is no record of any merchants having an office at Botley until 1962 when the Bishops Waltham branch closed. No weighbridge is shown on any large scale maps of the station; there was however a public weighbridge in the town. A Type 1 signal box was opened at the west end of the down platform, at the junction with the Bishops Waltham branch in October 1873. At that time the box was provided with a 30-lever frame but in later years this was reduce to 26. As passenger numbers increased, a demand for better waiting facilities was put to the L&SWR in September 1875 but these were not approved until 1884 when a brick waiting room was provided at the west end of the main station building. It had a sloping roof which extended over the platform to form a canopy with a deep valance. At the same time, an open footbridge linking the platforms was built at the east end of the station; following a petition from railway users the bridge was covered in 1894. A further waiting room on the down platform and improvements to the gents' toilets were approved in February 1890 but the waiting room was never built. A refuge siding was provided to the east of the station on the up side in 1893 and extended in 1894. As each strawberry growing season was drawing to an end it was necessary for the L&SWR to make special arrangements to cope with the sudden surge of traffic. A good season could result in a bumper crop as in 1904 when a record 1,500,000 baskets were dealt with. An additional siding to deal with this traffic was approved on 15 October 1884 and the station approach road was widened in 1892 to prevent bottlenecks. The 1909 OS map reproduced below shows that the loop on the single siding had been removed and replaced with two parallel sidings running along the south side of the dock. It is in the area between these two new sidings and the perimeter of the yard that strawberries were loaded onto special ventilated vans. As can be seen on some of the photographs below, this part of the yard became a hive of activity during the short season. In April 1911 a third parallel siding was brought into use. This required the purchase of additional land which allowed the existing sidings to be slewed and lengthened with each now able to accommodate 26 vans. Strawberry traffic reached a peak before WW1 and lasted well into the 1930s when an outbreak of red core disease hit the area; the strawberry traffic around Botley went into a steady decline, although by the 1950s the yard was still handling 15 van loads a day during the season. A fruit traffic office was provided at the top of the station approach road, but when this traffic declined after WW2 the office closed c1950 and the building was taken over by Murphy Chemicals. In the 1930s Botley station staff comprised the stationmaster, who was required to live in the house above the booking office (not rent free), 2 junior clerks, 3 signalmen, 2 grade 1 porters and a checker. A permanent way gang of five men based at the station was responsible for a section of the main line and the branch. WW2 saw some military activity at Botley with the down siding parallel to the Bishops Waltham branch being extended. In the yard a thick concrete surface was laid at the end of the dock for turning tanks. Botley yard closed on 2 October 1967. In 1973 Foster Yeoman opened an aggregate railhead depot and coated roadstone plant in the former goods yard. The company occupies land on both sides of the line and the short section of track retained along the branch was doubled for use as a long siding; this includes the line into the bay platform. Stone arrives by rail from the Mendips and is discharged into a hopper over the branch siding. It is carried over the main line to the works by conveyor. All of the up platform buildings were demolished at this time with a bus shelter being provided on the platform. The company is now known as Yeoman Asphalt. Botley signal box closed on 20 June 1982; at the time of writing the boarded-up box is still standing. The area is still prone to land slips with the most recent on 31 January 2014. The line reopened on 15 March 2014. The Bishops Waltham branch had its origins in a much grander plan put forward in the early 1860s. A group of businessmen in the Southampton area proposed a railway running across eastern Hampshire into Southampton. They were led by Arthur Helps, a prominent national figure (he had recently been made Clerk of the Privy Council) and writer. He owned an estate near Bishops Waltham and had financed the creation of the town's Coke & Gas Company and a brickworks. The aim of the Bishops Waltham, Botley & Bursledon Railway (BW, B&BR) was to link the proposed Petersfield & Midhurst Railway to the main line into Southampton which was owned by the London and South Western Railway (L&SWR). The L&SWR was a large and established company having built the south-western main line between London and Southampton in the 1830s. The promoters of the Bishops Waltham Railway, like many similar small railway undertakings, hoped to arrange for the L&SWR to operate the line once it was built in return for a share of the takings. The L&SWR objected to the proposed BW, B&BR as a potential competitor to its own line and refused an agreement. However the L&SWR was equally wary that its main rival, the London, Brighton and South Coast Railway (LB&SCR) would secure the rights to operate the line itself and thus be able to run its services right into the heart of L&SWR territory. The L&SWR and the BW, B&BR reached an agreement that the smaller company would reduce its plans to a simple branch between Botley and Bishops Waltham. The L&SWR would operate the line at a favourable rate and would consider an extension to Petersfield in the future. The BW, B&BR changed its name to the Bishops Waltham Railway Company (BWR). John Collister was appointed as engineer for the line and he immediately started work surveying the proposed route and preparing working plans for the construction of the line. The Bishops Waltham Railway Act received Royal Assent on the l7 July 1862. Messrs. Rilson and Ridley were appointed as contractors and as sufficient money had already been raised for the construction of the railway's earthworks and track, work was quickly underway although no plans had been drawn up for the terminus at Bishops Waltham and a temporary station was initially proposed so the line could be opened as quickly as possible. By the end of the year, half the available capital had already been spent and a Parliamentary Bill was prepared seeking an increase in the authorised capital of the company in order to complete the work. The L&SWR made its intention known to the Board that it would be seeking powers to purchase or lease the line in the next Parliamentary session. By February 1863 the L&SWR appeared to have lost interest in purchasing the line but the Board remained optimistic about its future and announced at the first shareholders meeting on 28 February 1863 that: ‘the whole of the works are now nearly completed with the exception of the trimming of the slopes and ballasting of the permanent road. I have no doubt but that the line will be so far completed by the end of next month that heavy traffic may pass along’. In April, the Board announced that the line was ready for opening to passenger traffic although no station of any kind had yet been built at Bishops Waltham. On 8 May a tender was let to a Southampton contractor for the building of a temporary terminus to be completed within a fortnight. Once this had been finished the line was inspected by Captain Rich RE for the Board of Trade, a requirement before any new line can be opened to the public. Captain Rich reported, ‘The new line is single throughout, with sidings at Botley Station and at Bishops Waltham.....land has been purchased for a double line......All the bridges appear to be well and substantially constructed. There are no engine turntables but as the line is only about four miles long, they might be dispensed with, on condition that Tank Engines only are used. There is one public level crossing at Bishops Waltham Station.’ Some additional minor work and alterations were required by Captain Rich and he concluded that the line could be opened for passenger traffic once this work had been completed and on receipt of a guarantee that only tank engines would be used to ensure that the line was not worked at a great speed because of its many tight curves until a turntable was provided at Bishops Waltham. These stipulations were quickly agreed and notified to the Board of Trade on 30 May. The initial service consisted of six trains in each direction on weekdays with three on Sundays. 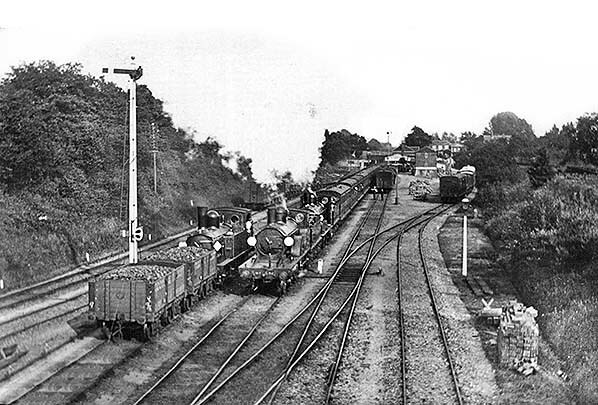 Once the line was open, the BW board were keen to start work on Bishops Waltham station as soon as possible but they were forced to take out further loans and a mortgage to fund the construction of the passenger station and a goods yard. By August 1864, work was underway and at a shareholders meeting at the end of that month it was stated that the facilities for both passengers and goods were nearing completion. The completed terminus eventually opened in March or April 1865. In the first few years, traffic returns were disappointing due to a number of factors including the economic depression and the delay in building the terminus and shareholders were informed in February 1866 that there was no question of a dividend being paid. In 1866 the mid-afternoon train was taken off leaving five trains in each direction on weekdays and the Sunday service was withdrawn. The BWR tried to fix an agreement with the L&SWR to extend the line further in search of extra traffic and a second company, the Bishops Waltham & Petersfield Railway (BW&PR), again led by Arthur Helps, was formed to try to secure investment for the project. This unfortunately coincided with a minor banking crisis and a recession in the British economy which saw investment in new railway projects dry up. It also further reduced traffic over the Bishops Waltham branch line which was dealt a fatal blow in April 1867 when the Bishops Waltham Clay Company, the local brickworks and one of the railway's main customers, went into liquidation and ceased production. The cattle plague which had broken out in southern Hampshire, coupled to the reduction in importance of Botley Market owing to the establishment of the large central market at Southampton, also took its toll. The BW&PR plans were abandoned in 1868. The L&SWR itself was making a profit from its operations over the line since it had none of the debts incurred in the line's construction yet took a proportion of all income from the branch. It continued to run trains along the line and simply billed the BWR for its outstanding payments. The BWR existed in a state of limbo for many years. In the 1860s the L&SWR proposed its own railway line between Alton and Petersfield; this railway would have had a junction near Warnford, on the west side of the Meon valley from where a line would run into Bishops Waltham, thus connecting to Botley and the Eastleigh to Fareham Line. This would have required major works of civil engineering including a large bridge or viaduct, and would have put Bishops Waltham on a major railway in the region. The plans never progressed. By 1870 the company's annual meeting was disbanded because no shareholders were present. Following the death of Sir Arthur Helps in 1875 the company's Board of Directors informally disbanded. 1871 saw an upturn in fortunes for traffic when the abandoned Clay Company works were acquired by Mark Henry Blanchard who recommenced production at Bishops Waltham in addition to his London business. A general increase in traffic may have been responsible for the introduction by 1873 of an additional morning return working. With the LWSR now in control in all but name it came as no surprise when a special general meeting of the BW Board was held on 11 October 1881 ‘for the purpose of considering and if thought fit sanctioning the sale of the Railway sidings, stations, works and conveniences, undertaking and property of this Company to the London and South Western Railway Company’. The process was held up because the company was in chancery with no directors, treasurer or secretary to act on its behalf. The sale was eventually conducted by the BWR's chief creditor and it was agreed to sell the railway to the L&SWR for not less than £20,000 which would be used to pay off the company's debts. A Special General Meeting of the BW Company on the 30th December gave the final authorisation to approve the sale to the BWR in retrospect from 4th August 1881. BWR’s era of independence thus drew to a close. Born with hope and confidence and the promise of a rapid development in traffic, some eight years had instead witnessed the BWR struggle through a host of adversities crippling the establishment of the company, leaving it with a millstone of debts, and culminating in the inevitable sell-out. There is no doubt that the decline and ultimate failure of the Clay Company played a major role in retarding the development of traffic in the crucial early years of the railway’s existence. The L&SWR were quick to instigate improvements the first of which was the introduction of an additional mid-morning return service and 1883 and an additional mid-afternoon return service in 1884. During the 1880s, when the L&SWR was looking for a site for its main locomotive and carriage works, a group of Bishops Waltham businessmen offered a proposal to site the works at Bishops Waltham. The L&SWR did conduct a detailed study of the proposal, but the site of Eastleigh was chosen instead, being on the main line. Eastleigh grew from a village smaller than Bishops Waltham to a large industrial town centred on the works. In 1883 there was a proposal to extend the branch to Droxford but nothing came of this. An extension to Droxford was again proposed in 1901, during the construction of the L&SWR's Meon Valley Railway. On this occasion, a group of local investors formed a company to build a line northwards from Bishops Waltham to the new station at Droxford. The line would be built under the Light Railways Act 1896 to keep down costs. The L&SWR objected to the plans, citing the disruption a branch line would cause to its own operations at Droxford station. The Board of Trade was also sceptical that the line would remain within the terms of the Light Railways Act since it would require major earthworks, a tunnel and a large bridge or viaduct to cross the River Meon. The scheme failed to obtain an Act of Parliament and was abandoned. Whilst the line was usually only lightly used, with modest passenger numbers and low levels of freight, the line usually saw a period of frenetic, heavy use in the summer months during the strawberry harvest. 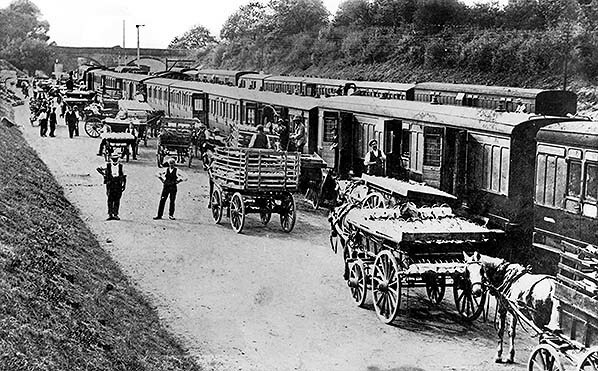 Southern Hampshire (including the area around Bishops Waltham, Botley, Fareham and Titchfield) was the UK's main strawberry growing region and during the harvest there was a near-continuous stream of special trains from the region to the London markets. Botley station had numerous sidings to accommodate the special trains the L&SWR put on for the harvest, and the Bishops Waltham line was key to shipping produce from the Meon Valley and the surrounding region to the main line. Despite the improvements to the weekday service many local people were unhappy that no Sunday service had been provided since 1886 and a well supported petition was sent to the L&SWR in August 1889 requesting the reintroduction of a Sunday service. This and a subsequent similar request were declined by the L&SWR. In 1890 changes were made to the existing train timings which quickly proved unpopular with local people. These led to further petitions and resolutions being put to the company but all fell on deaf ears until, on 5 November 1904, it was announced that steam railmotors that had been withdrawn from the Basingstoke to Alton line in August could be used on the Bishops Waltham and Turnchapel branches to improve their service. This was approved and appears to have been put into effect immediately. The Bishops Waltham branch was one of the few lines in the region to be worked by railmotors. These were popular for light rural lines around the turn of the century, and consisted of a small 0-4-0 type locomotive rigid-coupled to a single carriage. This provided a low-cost and simple vehicle. However, railmotors lacked the power to pull any other carriages, and so were unable to cope with sudden high passenger numbers, such as occurred on market days or public holidays, and so were replaced by light standard tank engines when the need arose. The 1905 working timetable shows 13 up trains and 12 down workings with one return goods service, the latter being worked by an engine. It is probable that increased traffic returns and savings in running costs led to the L&SWR relenting to the pressure to provide a Sunday service with 7 trains in each direction running in 1907. Following a petition from the residents of Durley, a halt was opened on 23 December 1909 at a point close to Durley Mill to serve mill workers and the Calcot and Frogmill areas. WW1 brought few changes to the line. Despite a reduction in passenger numbers a service was maintained throughout the war although the railmotors were withdrawn circa 1915 to be replaced by conventional locomotives. There was some additional traffic from 1916 when Northbrook House in Bishops Waltham was commandeered for use as a military hospital. In 1917 some 7,000 troops of the 3rd, 4th, 5th an 6th Battalions of the Hampshire Regiment arrived and were billeted in and around the town but this brought little extra traffic to the railway as most military movements went by road to Gosport and Portsmouth. One heavily laden troop train did depart from Bishops Waltham in late 1917 / early 1918 taking troops to a camp in Scotland. This was probably the heaviest and longest train ever to use the branch. 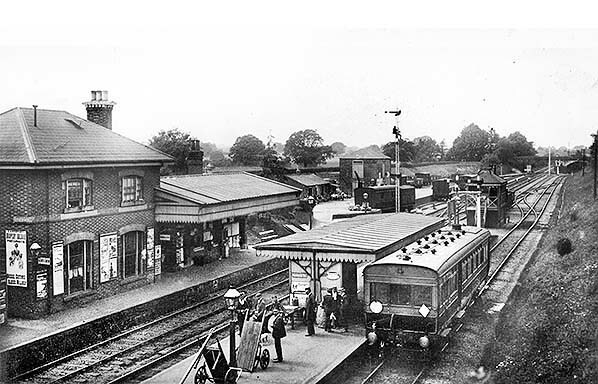 Although the passenger service had been withdrawn, Bishops Waltham station remained open with a twice-daily goods service; this was soon reduced to one train a day. The signal box at Bishops Waltham closed on 16 December 1935; all signals were removed and the branch was converted to hand operation. Initially WW2 brought no changes but that was to change as the war progressed. When the bombing of Portsmouth intensified in 1940 the main Portsmouth warehouse belonging to Timothy Whites (chain of dispensing chemist and houseware stores) was destroyed. The company relocated temporarily to Swanmore House close to Bishops Waltham for 3½ years and during that period a large volume of merchandise was handled by both Bishops Waltham and Botley. Parcels and small goods at Bishops Waltham and large goods at Botley. Later in the war, the Royal Engineers requisitioned Hazleholt Park to the north-east of Bishops Waltham. A large store was established there and a wide variety of military goods were brought in by rail to Bishops Waltham. At its peaks, this amounted to one train a day carrying goods such as dannett wire, pickets and steel hawsers, all believed to have been intended for the home defence following the Dunkirk evacuation. Everything arriving at the Bishops Waltham terminus was handled by military personnel who took over the stationmaster's office and established a REME workshop at the rear of the yard. By 1944 the Royal Engineers had gone and the house was taken over by American servicemen and a fuel storage was established in the park as part of the build-up to the invasion of Europe. Large quantities petrol, aviation fuel and lubricants were brought in by rail, mostly in fifty gallon containers and often requiring up to two trains daily. The handling of this bulky traffic was eased by the American Military who increased the area of hard standing in the yard by infilling part of the pond. The store was dismantled after D-Day but the branch still had a part to play in the war effort becoming a long siding for the storage of empty tank wagons. During this period all goods traffic normally handled at Bishops Waltham was transferred to the yard at Botley. After the war branch life returned to normal with the return of the daily goods train. Nationalisation in January 1948 brought no immediate changes. With the popularity of rail enthusiasts excursions growing in the 1950s the branch once again handled occasional passenger services. The Railway Correspondence and Travel Society organised a railtour just covering the Bishops Waltham branch. A second railtour was organised by the Stephenson Locomotive Society on 3 May 1953 running from Gosport to Bishops Waltham then on to Havant. By the middle of the 1950s there had been a huge drop in the type goods being handled It was clear that the branch was now living on borrowed time. The last railtour to visit Bishops Waltham was the Branch Line Society's Portsmouth Area railtour on 7 March 1959. Traffic dwindled even more that year, unable to compete with road transport. Following the withdrawal of the Saturday goods service and the weekday service reduced to two or three trains a week so it came as no surprise when final closure was announced for 27 April 1962. As with the closure to passengers 30½ years earlier the last train almost passed unnoticed with only a handful of enthusiasts to see the passing of the branch on a cold and damp day. Railway staff did however put on a show with detonators at both ends of the train and at many of the crossings. Shortly before the track was lifted the Hampshire Narrow Gauge Society looked at the possibility of laying a 2' gauge line along the track bed from Maddoxford on the outskirts of Botley to Bishops Waltham where a new station would be built to the south of the level crossing. These plans persisted till 1964 but eventually they lost interest and the proposal was forgotten. Bishops Waltham station was demolished in the late 1960s to make way for road improvements but much of the track bed is still traceable and short section to the south of Bishops Waltham is now a public footpath. Some track still exists as a long siding at the southernmost end of the line. This is used by Foster Yeoman who operate an aggregate railhead depot and coated roadstone plant at Botley station. Two iron overbridges either side of Durley Halt are extant. Tickets from Michael Stewart. Route map drawn by Alan Young. Bradshaw from Nick Catford. L&SWR rail-motor No.1 is seen in the bay platform at Botley station between October and November 1904, shortly after the rail-motor came to the branch. At this time, the L&SWR was using a headcode system which comprised circular and diamond shaped white plates. Rail-motor No.1 is displaying one circular and one diamond plate; this was the headcode for the Bishops Waltham branch but it was also used for a number of other routes on the L&SWR system. Rail-motors 1 and 2 had a first class section seating eight. This is believed to have been the section between the doorway and the engine: not the best place to locate first class seating. This mistake must have been quickly realised as rail-motors 3 - 15 had first class moved to the other end of the unit, as was the doorway. A member of staff is seen climbing the up starting signal, presumably to refill the lamp. The goods yard is seen in the background with a number of vans standing at the large dock. The buildings at the back of the dock are the goods shed (left) and the larger two-storey goods warehouse. 1868 1:2,500 OS map shows the layout of Botley station six years after the Bishops Waltham branch opened. At that time the goods yard was small and comprised a single siding with a loop running alongside the dock. The two buildings shown at the rear of the dock are the goods warehouse (left) and the smaller goods shed. The station building is shown on the up platform, at this time there was no waiting room alongside. The waiting shelter is shown opposite on the down platform. There is no record of when this was built so it is assumed it was built when the station opened and was modified or rebuilt when the Bishops Waltham bay platform opened in 1862. It survived in a shortened form into the 1990s. 1909 1:2,500 OS map shows substantial changes and additions. The goods yard has been expanded with two new parallel sidings running along the south side of the dock. There is also a down siding running for a short distance along the Bishops Waltham branch. A crane (Cr) is identified in the yard standing on the dock close to the goods shed. The rectangle to the left of the goods shed is a livestock pen. The waiting room with a canopy is now shown on the west side of the main station building; this was built in 1884. A small building has appeared on the approach road, just to the west of the station building; that is a fruit traffic office. Beyond this building, the road into the yard has been widened; this was done in 1892 to stop bottlenecks in the strawberry season. A footbridge now spans the two platforms; this was also built in 1884. A signal box, built in 1873, is seen at the west end of the down platform. 'LB' beside the station building indicates a post box, probably wall mounted. 'Dr Fn' at the top of the approach road is a drinking fountain. This was combined with a horse trough and is seen in one of the pictures below. It was built as a memorial to Queen Victoria's Golden Jubilee and to provide refreshment for the hard worked horses brining strawberries to the station. L&SWR steam rail-motor No.1 is in the bay platform at Botley seen while working the Bishops Waltham service between October and November 1904. No.1 and No.2 were both new in 1904 and the second series, 3 - 15, appeared in 1905 - 6. All these railcars, with the possible exception of No.2, were run-in on the Bishops Waltham branch. No.1 also operated on a number of other branch lines and by 1910 was on the Hounslow - Gunnersbury service. These first two L & SWR rail-motors were built with the rather brutish-looking casing around the engine unit, as seen above, whilst the remainder had what was in effect an extension of the passenger section coachwork, giving a much neater appearance. Below the inner end of the engine section one of the cylinders can be seen; there were two cylinders, one each side, driving the outermost axle. Therein lay one of the weaknesses of the L&SWR rail-motors: the single powered axle. On the roof of the engine section the rather large chimney, which was a feature of all the L&SWR rail-motors, can be seen. A chimney of this size married to such a small boiler leads one to wonder just how good, or otherwise, at steaming these rail-motors were. Livery of rail-motors 1 and 2 was L & SWR green for the engine section and brown (lower) and salmon (upper) for the passenger section. The roof colour is not known. L&SWR green was an attractive 'grassy' shade and although the above view is by no means clear the rail-motor engine section appears to have been lined-out, perhaps fortunately given the slab-sided design. Thus the livery of these two rail-motors matched conventional L&SWR trains of the period. The later series, 3 - 15, had the brown and salmon carried round the entire body. Below the cantrail of No.1 midway along the passenger section is what appears to be a destination board but, if that is what it is, it is unreadable. Guard George Padwick is seen to the left of the lamp. Looking south-east towards Botley station from the pedestrian bridge at the junction with the Bishops Waltham branch c1907 during the strawberry season. A fruit train consisting of ventilated vans and double-headed by a pair of Adams 4-4-0s is preparing to leave. A Class 02 0-4-4T is seen alongside with two wagons of coal and appears to be waiting to cross over into the yard. A goods train is seen in the bay platform. In the yard, fruit vans are seen in both of the other sidings and in the distance the two-storey goods warehouse is seen. This view is typical of Botley yard during the height of the fruit season each June. A feature of trains in the fruit picking season was the appearance of other companies’ stock well away from home, in the same manner as goods wagons in general. The difference with fruit trains, as seen above, was that passenger stock was also included, and no confirmed reason for this has been found although a number of suggestions have been put forward from accommodation for representatives of the fruit buyers and / or fruit pickers to the stripping-out of interiors to provide more accommodation for fruit. The latter suggestion seems most unlikely, albeit not entirely ridiculous, as much of the passenger stock seems quite antiquated, even for c.1907, and probably due for withdrawal. The train seen above comprises Midland Railway, L&NWR and L&SWR stock. On the far left is Midland Railway ventilated van No.251; the next two also appear to be Midland vans while the pair beyond are L&NWR vehicles. The white squares below the waist of the Midland vehicles are frames for labels. L&NWR vehicles also had these but above the waist, and one is just visible on the fourth vehicle. Note the detail of the open van doors nearest the camera. It is said that vans allocated to strawberry traffic were fitted with shelving to protect the fruit and this may explain the design of the inner side of the doors. In profound abundance are piles of wicker baskets. The procedure seems to have been to transport the strawberries to the goods yard in these baskets and then transfer them to trays designed for the van shelving. The baskets in the foreground replaced earlier wooden orange boxes which caused a lot of damage to the fruit. The smaller baskets seen behind held 3 to 4 pounds of fruit. Photographic evidence suggests, however, that some fruit was transported from grower to railway already in trays. The idea of these vans with shelving rather puts one in mind of the hearse vans once used on the London Necropolis trains (also known as the 'Dead Meat Trains' or 'The Stiffs Express') between Westminster Bridge Road station and Brookwood cemetery. Another view of the yard in 1907 during the strawberry season. The huge number of horse-drawn carts arriving at the yard caused a bottleneck on the approach road, sometimes up to half a mile long, so the road was widened in 1892 in an attempt to relieve this problem. Unfortunately the angle makes it impossible to identify most of the railway vehicles seen above, but that on the right is very obviously of L&NWR origin and almost certainly in that company's attractive crimson and off-white livery. These liveries suited the rolling stock of the time, with its body mouldings and other ornate features, very well. The application of this L&NWR livery to the van seen above tells us that the van is passenger rated, meaning it is suitable to run in passenger trains. The third van from the camera appears to be another of the same type. The smaller 4-wheeled van between the two also appears to be of L&NWR origin but the livery of both is uncertain. The two carts on the right have their strawberries already loaded onto the trays which reputedly slide onto shelving in the vans. On the left and extending into the distance we can see the abundant empty baskets from which, it is assumed, strawberries have been decanted. This and similar images illustrate very well just how important the railways once were over and above passenger traffic, at a time when the only alternatives were horse-drawn road vehicles and waterways. The railways made possible many things we now take for granted, such as the enjoying of strawberries and other fruit in parts of the country where it would not otherwise be available fresh. All this is a world away from today when we can purchase seasonal fruits all year round thanks to imports of the tasteless offerings which have all-but killed off Britain's agricultural and other industries. 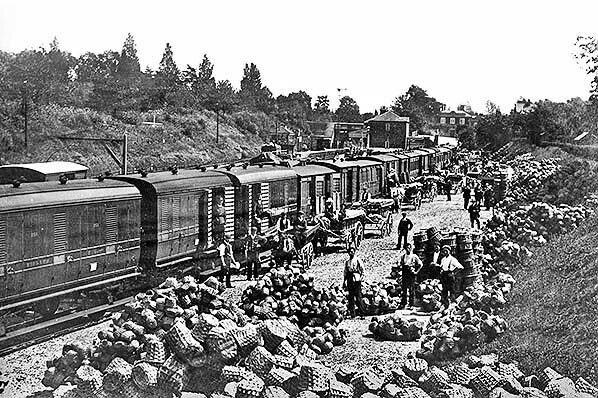 A busy scene in the sidings at Botley during the fruit-picking season in the first decade of the twentieth century. 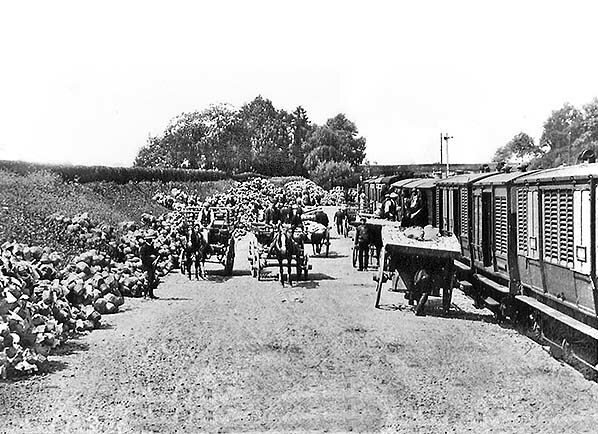 The horse-drawn carts have been carefully loaded with the produce of a number of growers ready for loading onto trains. It is not entirely clear why these trains comprised a large number of passenger vehicles but possibly they were returning pickers' specials which, for operational reasons, had passenger-rated vans attached. A few vehicles can be identified: the full brake in the right foreground is an L&SWR Diagram 662 44ft bogie example of which a large quantity were built in the 1893 - 1902 period. All, bar nine, had been withdrawn by WWII, the nine survivors going to the Isle of Wight where they lasted well into BR days - until 1956 it is believed. Another Diagram 662 vehicle can be seen in the right background. The example in the foreground is in the brown and salmon livery introduced by William Adams whilst that in the background appears to be in an earlier livery. Both appear to lack the additional ventilators deemed necessary for fruit traffic, however. The vehicle only partially visible on the extreme right looks suspiciously like an L&SWR Diagram 791 48ft bogie van. A number of these had end-loading doors for the transport of aeroplanes and others were adapted for the stowage of mail bags. Those used for fruit had additional ventilation (in the roof) from new. All had been withdrawn by 1940. It has not been possible to identify all the passenger stock although two, at least, are L&SWR 4-wheelers. In 1908 a number of these ended up on the Colonel Stephens railways where they seem to have lasted, in varying degrees of dilapidation, until sometime during WWII.